What is the difference between an enrichment project and an extension activity, and how does curriculum compating help gifted students? That’s the main question that I had to try to answer to a few fellow teachers. I believe that each has a place in the regular classroom for gifted students who need to have an alternative assignment to help meet their educational needs. To begin, let me discuss the differences, then how they can be used in the regular classroom. Enrichment projects are projects based on a topic the student is interested in that will lead to new in-depth learning, or these projects can be based on the topic you are currently teaching, but allow gifted students to have a compacted curriculum. To help challenge these students teachers need to create enrichment projects that allow them to dig deeper into the content you are covering. These projects are done either by themselves or with a partner or small group. These projects are usually hands-on and bring in some real world lessons. These projects can use students’ prior knowledge as a baseline, and the project will push the student deeper into the topic. The project enhances a student’s education by bringing new concepts to light or by using old concepts in new ways. An extension activity is an activity that extends the learning of the lesson. Extension activities can be done in small groups or by a single student. These extension activities are leveled to fit the student. For gifted students these are challenging. For struggling students these activities can be a reinforcing skill activities. Students don’t choose their extension activity like the enrichment project. I spent many years as a regular education teacher, and I remember the demands on time and resources that comes with that. Many teachers think that having students doing different assignments is too much of a hassle. I personally believe that it is my responsibility to provide the best education for my students. The best doesn’t always translate into easy. The reason regular education teachers must have enrichment and extension activities in their classrooms and part of their instruction is because students need to take what they know or what they learned and apply it to the next level. Generally, extension activities and enrichment projects are at the upper Blooms Taxonomy levels. Our role as teachers is take our students to where they are and take them up the Blooms latter. Enrichment projects and extension activities allow students to have their own educational experiences. Gifted students love to be challenged. They also love to have the opportunity to explore some of their own interests. Sometimes it isn’t hard to match some of their interests to projects that you can connect to your state standards. Gifted students also shouldn’t be punished for getting their work done quickly. They don’t want more work. They want to be challenged just like their peers. Gifted students shouldn’t be placed as tutors throughout the classroom to help those who are not finished. This isn’t fair to them since they are there to learn not to tutor. By tutoring other students you rob them of the opportunity to have their own learning experiences. If you are a regular education teacher, and aren’t incorporating enrichment projects and extension activities into your classroom here is a way to start. Take it easy, and do this at your own pace. When you get a good routine down, your students will benefit from it. Susan Winebrenner states in her PowerPoint 10 steps to help gifted students through instruction so they can have enrichment projects and extension activities. One: Teacher identifies key concepts all students are expected to master. Two: Teacher prepares pre-assessment and extension materials. Three: Students are allowed to briefly examine the upcoming content. Four: Students may volunteer to take a pre-test to demonstrate their previous mastery of upcoming content. Five: Eliminate practice, drill, and instructional time for students when teaching concepts students have already mastered. Allow students to work on extension activities during the time other students are experiencing direct instruction. Six: Expect students to participate in direct instruction when concepts they have not mastered are being taught. Seven: If pre-testing is not possible because content is new, streamline instruction of key concepts so eligible students can still spend part of their learning time on extension activities. Eight: Expect all students in the class to participate in content assessment activities at the same time. Nine: Keep records of this process and of which extension activities students choose. Teach students how to keep careful records of their own progress. Ten: Meet regularly with students who are experiencing compacting to help them locate resources, to develop the confidence to choose challenging work, and learn to follow the behavioral expectations for working independently. Differentiation of enrichment projects or extension activities can come in many different forms. One of the easiest to use is a choice menu. Doing a Tic-Tac-Toe board with projects in them is a great way to start. (I wrote about these on this slide show.) A great resource to use is Laurie Westphal’s Differentiating Instruction with Menus series. She has a book for every subject. What are you doing in your classroom to challenge and grow your gifted students? How do help regular education teachers teach gifted students? 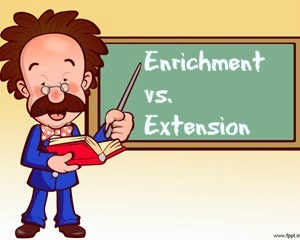 I enjoyed reading this post as it is certainly helpful to have the contrast of extension vs. enrichment activities. I have been teaching honors classes for a few years and currently taking one class towards Gifted and Talented (GT) certification (professional development done through my school district), and before now I’d always been confused about what truly is enrichment for gifted and talented students. I do believe that those student should not just have extra work piled on (and I have in the past been guilty of doing such a thing), as the work should be more challenging and not just extra work for them to do. We all know that these students can get bored easily and occasionally cause behavior issues even if they are not being challenged enough; or I’ve seen it go the other way where they just shut down and don’t really do any of the work at all. What may help is giving an example of the difference between an enrichment activity and an extension activity. I do know that teachers sometimes don’t want to give themselves more work by giving students different assignments (like you mentioned in your post: “Many teachers think that having students doing different assignments is too much of a hassle”). However, they are doing their students a disservice then as that means they are not differentiating their instruction as they should be doing. I think sometimes gifted and talented students are forgotten about because we know they are successful students and we tend to focus on the lower level students instead, but if we can challenge our GT students more and in the right manner than those students we feel successful in the classroom.